I had a really hard time deciding what to pick for BotW this week. Like really hard. I read an awesome thriller – but it was for Novelicious so I can’t pick that, although I’ll try and remember to post a link here when that review goes up. I read some nice cozy crime and a bit of romance. And then three really fun women’s fiction books which it was hard to chose between. But I’ve gone for Kat French’s The Piano Man Project because sometimes you need a moody, troubled, Alpha hero – and Hal is a really good one. Honeysuckle has a problem – and it’s not that her name is Honeysuckle. She needs a man to fix a… problem that she’s encountering. He needs to be good with his hands *wink wink*n- and so her friends decide a pianist may be the answer and start trying to set her up. But then there’s Honey’s new neighbour Hal – he’s anti-social, grumpy and troubled, but Honey keeps coming back to try and help. On top of all this the old people’s home where Honey works is under threat and she’s got to do something to try and save it. This is touching and funny and has a darker edge perhaps than my summary above might suggest (I’m not going into why because it would be too much of a spoiler). It’s also a bit sexier than some of the other books you’ll find alongside it on the shelves. Author Kat French has an alter-ego who writes erotica and she’s brought some of that to the table in this. It’s not in 50 Shades territory, but it is a notch above what I’ve usually found in romantic comedies. Honey does have a strong streak of trying to fix things/people which I guess might rub some readers up the wrong way, but I found her charming and caring and not a doormat. And there are problems in this book that aren’t fixable no matter how hard she tries – and I liked that. I found Hal a compelling hero – even though he’s hard work and demanding and doesn’t really appreciate Honey’s efforts on his behalf for a lot of the book. 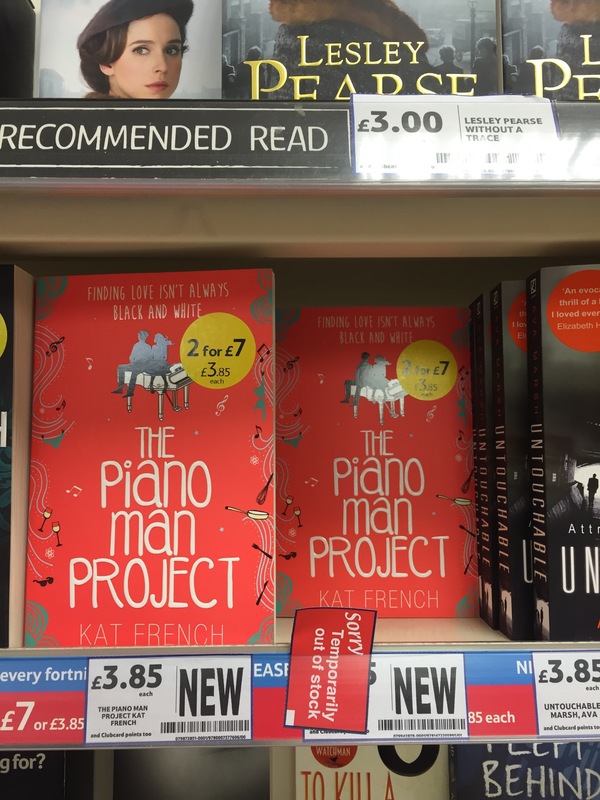 The Piano Man Project was well in evidence in my local enormous supermarket this week – as you can see from the picture above – so it should be nice and easy to get hold of, but it’s also just 99p on Kindle at the moment so it’s a real bargain (Amazon have the paperback for £3.85 too which isn’t to shabby either). I’ve heard a little about this book, so thank you for the review. This sounds pretty good, actually. Cheers!